Additional blue belts are arriving on the team and they’re all saying that they can feel the difference our wrestling makes in sparring. We practice our wrestling basics every training session – refining our posture, our hand positioning – our set-ups – gaining confidence and vital mat time on our feet. 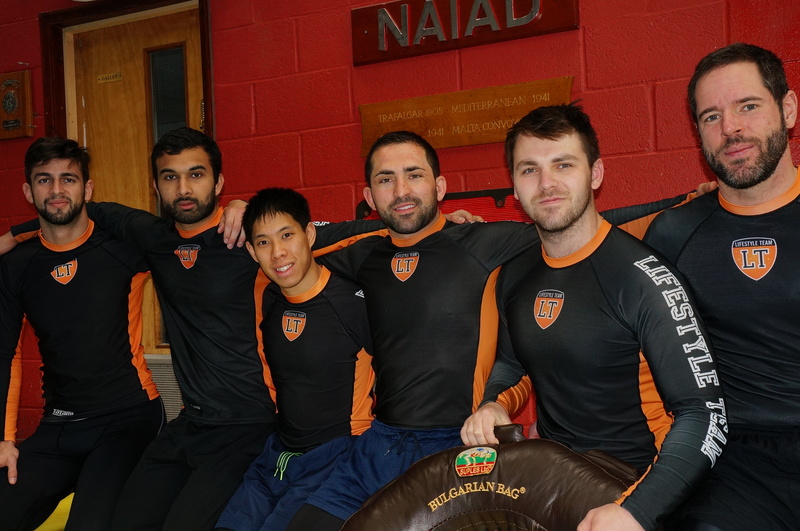 Just a few of the team posing with the Bulgarian bag – they add slick set-ups and takedowns to their solid BJJ groundwork..
Our training sessions are a mix of stand-up work and Gi and No-Gi training. If you are a blue belt that hasn’t trained for a while – we’re offering free training for three months if you’d like to join our Monday and Thursday, two hour training sessions.